As the United Nations marks World Press Freedom Day, a watchdog’s annual report exposed yesterday (1 May), a divided European Union; with four member states categorised as just “partly free”, and six others among the ten countries with the highest degree of press freedom worldwide. Global press freedom has fallen to its lowest level in more than a decade, the report revealed. Europe is facing a growing gap between northern countries, with the world’s highest levels of media freedom, and southern countries with a degree of freedom comparable to Burkina Faso or Botswana. The global decline was driven in part by the major regression in several Middle Eastern states, including Egypt, Libya, and Jordan; marked setbacks in Turkey, Ukraine, and a number of countries in East Africa; and deterioration in the relatively open media environment of the United States. In the EU, the report shows a deterioration of press freedom in two countries in particular, crisis-hit Greece and Spain. Greece dropped from 65th in 2012 to 83rd in 2013. Spain dropped from 43rd to 52nd. Cyprus sank from 37th to 45th, and Bulgaria from 77th to 78th. The three worst EU countries are Croatia, 81st from 83st last year, Greece at 83rd , the same as Botswana, and Romania, which is 86th with Burkina Faso. The six EU countries in the top ten of press freedom are Finland, Sweden, Belgium, Denmark, Luxembourg and Netherlands. Some EU countries improved their ranking. Estonia stood out after rising to 13th place, from 22nd last year. Other EU countries have the best world press ranking worldwide. Sweden shares first place with non-EU member Norway. Belgium, Finland and the Netherlands share third place, and Denmark and Luxembourg share sixth place with non-EU member Switzerland. Estonia and Ireland are in 13th, Germany and Portugal 19th, Czech Republic 27th, the United Kingdom is 31st and France, Malta and Slovakia are in 35th place. Lithuania and Slovenia are both in 40th, followed by Cyprus at 45th, Poland 47th, Spain 52nd, Latvia 55th, Italy 68th and Hungary 74th, up from 78th last year. Of the 197 countries and territories assessed during 2013, a total of 63 (32%) were rated free, 68 (35%) were rated partly free, and 66 (33%) were rated not free. The partly free EU countries are Italy, Hungary, Bulgaria and Romania. A number of EU membership candidates and hopefuls are also categorised as partly free. Montenegro and Serbia are in 74th, Albania and Bosnia and Herzegovina and Kosovo are 96th. According to the European University Institute (EUI), the global decline in media freedom is a threat to journalists and to citizens around the world. Journalists, both in authoritarian regimes and in established democracies, face growing pressures. States are increasingly adopting media-restrictive policies aimed at punishing and silencing journalists and impeding the free flow of information. In Europe, the impacts of the economic crisis have accelerated restrictions to media freedom and increased pressures on journalists. In Greece, the state broadcaster was closed down. In Bulgaria, reporters are repeatedly victims of police violence and in Hungary lawmakers have implemented repressive legislative media reforms. In Croatia, Italy and Slovenia journalists face prison terms for critical reporting, which is in the public interest, EUI stated in a communiqué. 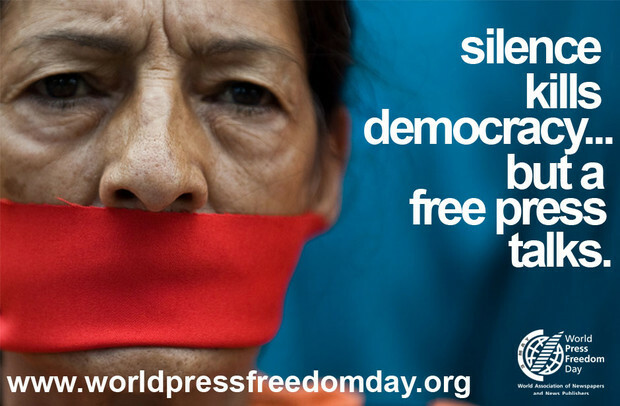 The UN General Assembly designated 3 May as World Press Freedom Day in 1993. This year’s theme, “Safe to Speak: Securing Freedom of Expression in All Media”, seeks to rally global action to protect the safety of all journalists worldwide and to break the vicious circle of impunity for crimes committed against them. The European Union has long been hailed as one of the areas of the world with the greatest press freedom. However, NGOs and international organisations warn that this may be under threat as the media becomes increasingly concentrated in ever fewer hands and some governments engage in politically-motivated lawsuits and outright censorship. Seems kind of strange as the EU Commission is extremely intolerant of criticism of even the smallest variety as it is of course incapable of wrong. But then so many of its officials were once Young Pioneers. It supports the marginalization of Christian beliefs while turning a blind eye to the excesses of other religious groups through the application of a Politically Correct (Social Marxist)Agenda.